Does high blood sugar cause leg cramps? While driving, I had a pain in my foot near the ankle. By the time I walked into the store, the pain was so severe I could not walk at all. Level 9 out of 10. Painful to move or touch. Had to get some one to drive me home and then could get on the bed only with help. No injury to foot. Woke up to find my foot was abut 80% better. Swollen a little, red in areas, and it hurts to bend down over a curb. I can tough and move it. I wondered if this might be a wake up call and I need better control--or is it not related. Partially, your leg cramps could be related to persistent high blood sugar levels (higher than 300). Please understand that diabetes cause damages to the nerves, especially to the peripheral nerves as they are long (that go to the legs). Such damages are clinically observed as leg cramps. However, to determine the level of damage, you should undergo some neurological testing (conduction, sensitivity, etc.) by the neurologist. - Another factor could be related to bad blood supply which is also partially due to high blood sugar. - You are saying that your foot at the ankle area is a bit swollen. This could be explain by arthritis. = Some blood work would really determine the level and type of arthritis. - I'd also suggest to exam your urine (urine analysis) to exclude probably kidney disease. At the end, Debbie, do not be frighten of my suggestions. I am giving all the possible causes to such problems, so you can discuss them with your physician to find out the real culprit. Thank you and hope it helped! 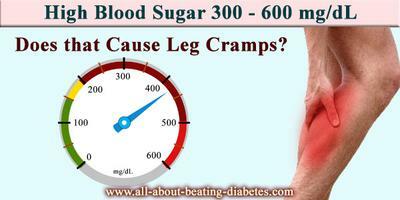 Comments for Does high blood sugar cause leg cramps? I've been living with High numbers for over 6 months and just started exersising and taking medication. I had lost feeling in my feet due to nerve damage and it's just starting to come back. I've gone from 220 lbs to 196 in a couple months. I feel so good these days. Blurry vision has cleared up, skin problems cleared up and a candida issue cleared up. Change your lifestyle dear heart. Value your life and be clear that you can heal yourself with diet, exercise and proper medication. Go see a pro-active health care professional to set you on the right course. Life is so precious and you can live a wonderful pain free life! She needs to see a good endocrinologist as soon as possible. Glucose levels of 300 are unacceptable.I was over 800 when I was diagnosed 25 years ago. I was treated by a General Practitioner my family doctor with not much help. After I went from 220lbs to 135lbs in 2 months I was sent to an endocrinologist. My A1C has been in the 6 to 8 range for 25 years now with an average of 145mdgl blood glucose. If this woman does not get proper medical treatment soon she will be dead. There are still some doctors that ave diabetics only counting sugars, instead of crbs. this is really outdated. She needs to count carbs and take the proper amount of insulin for the carb intake. The only way taking the same amount of insulin daily is if you eat the same thing and same amounts every time you eat. You need to take the proper amount of insulin for your carb intake. If this is done your sugar levels should be closer to normal 71-120 mdgl.